Aakash is 17 Years old boy having 90% mental disability by born. Now he is 17 years old but his mental development is very slow and still he is behaving like 1 year old child. He is doing all his regular natural activities on bed. His family members are taking care of him by serving him on bed. Due to abnormal development of his nervous system and brain, he is getting random convulsion (fits) and shocks to the body. We have shown the case to Neurogen Brain and spine Hospital, Chembur. They estimated, if we operate him for Neuro Regenerative Rehabilitation Therapy (NRRP) at least he can able to do his daily activities by his own. The treatment protocol involves a six days hospital stay during which time he will be extensively evaluated clinically. This will be followed by a Bone Marrow Aspiration from which subsequently the mononuclear cells are isolated. These are hemopoetic mononuclear cells which are injected intrathecally through a lumber puncture and CSF catheter. This is followed by 4 days of intensive Physiotherapy, Occupational Therapy, Speech Therapy, Counseling and other medical treatment as required. As you can see in attached pics, his legs and hand joints & bones are totally de-shaped due to no joint movement like normal human being. That can be re-structured after stage -1 (NRRT) operation and its incremental response. Already we consulted to Orthopedic surgeon and the claimed if his brain started working and started controlling, commanding and balancing him after stage-1 (NRRT) treatment, then he can stand on his legs after re-structuring of bones and hopefully he can walk also. Thank you for the wonderful support you have shown Aakash. 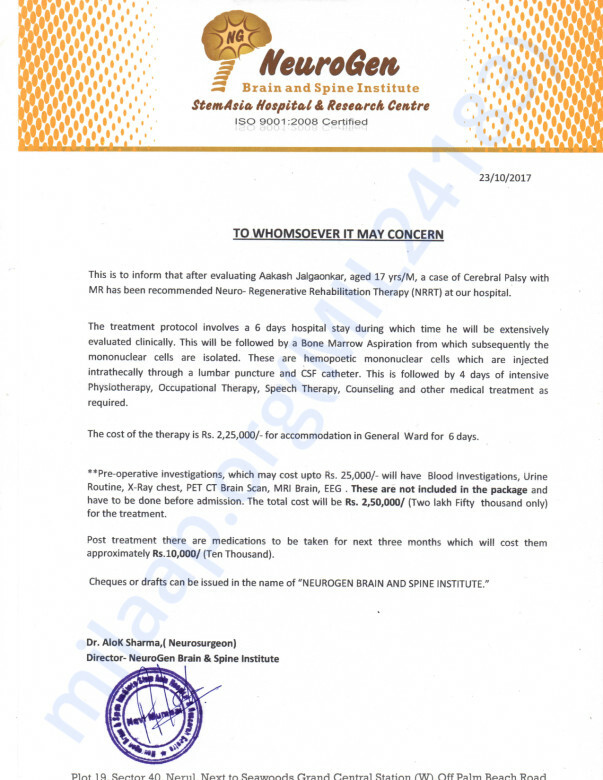 Treatment completed successfully in Neurogen hospital Mumbai. 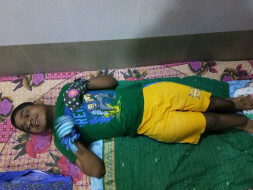 Due to some health issues with Aakash, his planned hospital stay was extended to get his health stability after treatment. Now he is fine and discharged from hospital. Thank you all once again for all the support you have shown Aakash. Do pray for his health and given treatment comes with the positive results.